What’s good? What really attracted me to this R&G stand was the bearing-mounted pin that slides into the bike’s hub. I already had a functional, if old and slightly ugly, single-sided paddock stand for my Ducati 996, but it had a fixed pin. Why does this matter? Well, storage aside, one of the primary reasons for raising your bike’s back wheel off the garage floor is to be able to spin the back wheel, and clean and lubricate your chain. That’s a sticky process if the pin doesn’t spin. Beyond this superb facilitation, the build quality of the stand is also rock-solid. I ride the 996 with aggravating infrequency, which means it spends a lot of time resting on this stand, ensuring that the rear tyre doesn’t develop a flat-spot. I have no qualms at all about leaving it sitting in mid-air, which isn’t something I’d say about many of the paddock stands I’ve used over the years. I’ve twice watched a stand fold like cheese, unceremoniously dumping its charge on the floor. The raising handle is thick and just far enough away from the wheels to make lifting an easy affair, without being so long that you constantly trip over it when walking past. 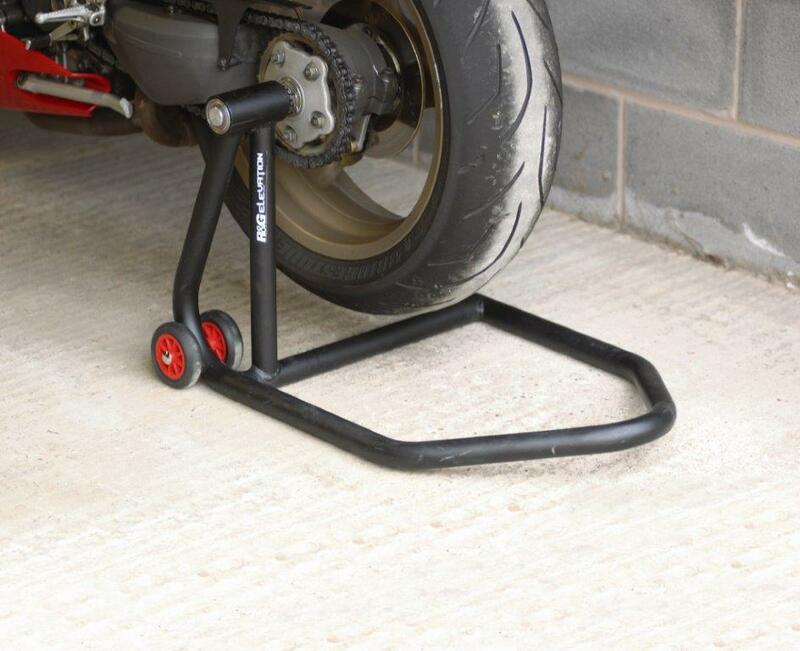 The main body is made from quality FE360 tubular steel, powder-coated black for a pleasing and durable finish. The wheels are often a weak-spot on stands, but again the R&G item is well spec’d with four quality wheels, which run smooth and secure, and offer great stability. What’s not? It’s a genuine struggle to criticise this stand. It’d be great if there were an option to have it in red, or old-skool Ducati bronze-gold, but really – it’s without fault.